Relatively few people in the general public knew at the time of John Kennedy’s assassination that there was a large conspiracy surrounding the death of this beloved president. Back then, who questioned the idea of the lone gunman? It took decades for people to finally come around and understand that a large conspiracy was involved. It is somewhat comforting to know that there are people questioning the story we are told concerning the tragic events of 9/11. It has not taken decades for some people to realize the media has been lying to us. Many aspects of 9/11 do not add up and will be explored here. The Internet has helped spread important information that you will never find on television or in the newspapers. People are waking up to the idea that 9/11 WAS NOT A TERRORIST ATTACK BY MIDDLE-EAST FANATICS! OK CITY BOMBING REVISITED; TRUTH CONTRADICTS MEDIA LIES. If the OK Bombing was the result of a fertilizer bomb, as the mass media has told us, then a POISONOUS CLOUD OF YELLOW AMMONIA would have formed all around the devastated federal building. The ammonia cloud would have been visible; it would have smelled and it would have been poisonous. No one could have entered the building right after the explosion unless they had gas masks. This is a physical and chemical fact. People were filmed running into the building immediately after the blast. Where was the yellow cloud of ammonia? A group of scientists appeared on C-SPAN and told the public about this ammonia-contradiction. They were never seen in the media again. The actual Oklahoma bomb seems more like a sophisticated, CIA detonation-device than a primitive-homemade job. There were reports on the news that mentioned ’sophisticated device’ was used. The public has also forgotten reports that multiple bombs were found at the federal building. ’Got defused bombs’ was aired on the news. The Oklahoma blast was certainly not the result of a simple, fertilizer bomb in a truck. This is mentioned as a prelude to 9/11. Probably...the same experts used to pull off the Oklahoma blast could have also been called in to help create the WTC disaster. The American Free Press (For Life and Liberty...Against the New World Order) is one of the few underground newspapers left. You are not going to read the truth and get the real story in regular newspapers. In the January 28, 2002 issue, the Free Press headline read: FORMER TOP GERMAN SPY SAYS U.S. WRONG ABOUT SEPTEMBER 11. A top German spook refutes the official version of what happened on Sept. 11, questioning why hasn’t Congress called for a special inquiry to investigate what really occurred on that terrible day? He believes the attacks had to be expertly planned and that only a state-run intelligence service could have pulled off such a mission. (We find out that Osama is ’bankrupt’ and could never have executed such a huge undertaking). Immediately after 9/11...a Saudi jet was permitted, by the U.S. Government, to go around the country and pick up members of the Bin Laden family. They were escorted out of the U.S. to safety overseas. At a time when millions of red-blooded Americans were not allowed in the sky, the rich Bin Ladens were protected and given very special treatment. If Osama was Public Enemy #1, then his family in America should have been at least highly interrogated. They should have been pumped for information on Osama. Instead, the Bin Ladens were transported by air to a safe haven while Americans were the ones interrogated at airports. Osama was a large CONTRIBUTOR to the political campaign of George W. Osama helped elect Bush! The media tells us that Bush and Bin Laden are mortal enemies. Nothing could be farther from the truth. They are best buddies; pawns in a deadly game perpetrated upon the planet. Osama was a CIA asset. He was trained and funded by the CIA. He was put into power by the CIA. Everyone should purchase the DVD and closely study what is called ’The Fireman’s Video.’ It is the Zapruder Film of 9/11. The Naudet Brothers, two French filmmakers, were on the streets of N.Y...September 11 making a documentary about the city’s fire-fighters. While on Canal Street, the crew was distracted by a low-flying plane. They quickly turned their attention to what was allegedly American Airlines Flight 11. For a few seconds, they caught on film the impact of the crash on the North Tower (WTC1). This filming of the exact moment of impact is not what the Bush administration expected or wanted. The Naudet Brothers were professional filmmakers and captured the crash on broadcast-quality tape. Leonard Spencer has created an extremely informative web-site called ’The Incredible 9/11 Evidence We’ve All been Overlooking.’ You can download parts of the Fireman’s Video and analyze it frame by frame yourself. 9/11 was a MAGICK trick; spelled ’Magick’ since our world’s leaders think so highly of warlock Aleistor Crowley. The disaster could also be a MAJIC trick, pulled off with Majestic 12 (James Bond) secrecy. A slow-motion analysis will expose the sleight of hand. DISTRACTION is the key. Anything can seem to be real if we are made to look at the wrong place and not see what is truly going on behind the curtain. If an idea is hourly pounded into our brains by the media, then any agenda from the authorities can control us. 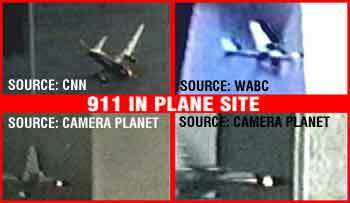 Flight 175, the plane that hit the South Tower or WTC2, is also part of the Big Lie. There is a very famous photograph of it just a second before it strikes the second tower. The photo has been on the front pages of many newspapers, in magazines and on countless web-sites. It is the defining moment of that dark day and, at the same time, one of the most incriminating images also. (See the later comments concerning the documentary ’In Plane Site’). 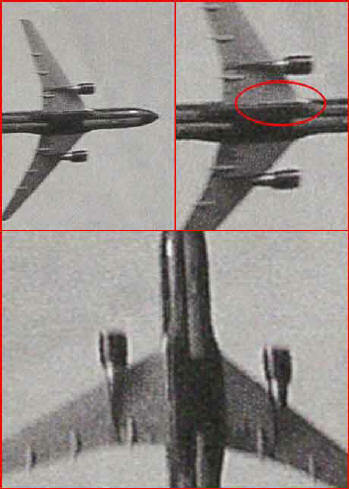 If we look closely, we can observe something on the underside of the plane that should not be there. The ’silvery lump’ casts shadows and there is even what appears to be a ’nozzle’ on the front. This is not standard issue of any American airlines. This was a missile or ignition-device attached to a smaller plane. 9/11 was not a hijacking by Middle-East terrorists. This was done by our very own government; sanctioned and financed by a secret World Conspiracy in order to send us to war! Both planes were supposed to be 767s. Both were flying from Boston to Los Angeles and both had, supposedly, been in the air for around 45 minutes before the crash. Why were the explosions so different? The first crash did not produce a huge fireball. The second produced an incredible, yellow fireball and caused much more damage than the first. The first plane seemed to have fired missiles. The relatively small explosion was due to the fact that little fuel was on board. This makes no sense for an aircraft that was supposed to fly coast to coast. The second plane was ’rich’ in fuel. Several eyewitnesses reported the strong smell of fuel after the second crash. The anomalous object on the second plane was probably an ’ignition device’ rather than a missile. This ignited a fully fueled aircraft and caused the amazing fireball. The explosions of both planes should have been the same, but they were not. These were not the planes that took off from Boston on 9/11. They were smaller. Examine the hole in the towers after the crashes. Measure the length of the damaged area. A real Boeing 767 has a larger wingspan and would have created a larger hole. It is more likely, believe it or not, they were CIA (remote-controlled) aircraft in an operation prepared well in advance and with amazing precision. Bush, Cheney and Condoleeza Rice refused to testify under oath even though the 9/11 Commission had the power to subpoena them. Someone did not want a thorough investigation into the events of September 11. This is not unlike the bogus Warren Commission with their absurd investigation into the killing of JFK. The highest officials are not going to reveal that THEY ARE THE GUILTY PARTIES INVOLVED. World Trade Building 7, which fell hours after the Twin Towers, was never hit by aircraft. We are made to believe that ’small fires’ were responsible for its destruction. Supposedly, it was the terrorist attacks that resulted in the demise of Building 7. Then, why did the Lease Holder, Larry Silverstein, admit ON FILM that Building 7 was PULLED? On a PBS interview, he stated we ’pulled it. They made that decision to pull and we watched the building collapse.’ ’Pulled’ is a professional demolition term for the collapse of a building with explosives. It takes weeks, or even months, to properly prepare for such an operation. Yet, Building 7 came down that Tuesday in September. The charges were already set well in advance. Never before had a steel framed building ever fallen because of fires. Fire cannot take down a steel structure. The government claims that the ’pancake theory’ was why the buildings fell as they did. We were told the steel struts slowly weakened because of the high temperatures from the burning fuel. Mixed with the air’s water molecules, the fires would not be hot enough to melt steel. The official explanations are far from credible. The American Free Press published PHOTOGRAPHS of explosions coming from the lower floors of the WTC. These bombs had nothing to do with the above plane damage. Obviously, the bombs were already set in place and we see them go off. The first 9/11 newscasts mentioned various people that heard EXPLOSIONS. Days later, the news never revisited the idea of bombs at the WTC. Maybe the most amazing and clear evidence that we were conned by a great illusion that day, has to do with the Pentagon. There is absolutely NO EVIDENCE that an airplane, Flight 77, ever hit the Pentagon! The government claims the plane completely vaporized...which is scientifically impossible. The Pentagon’s thick guard walls would have slowed it down, not disintegrated a massive plane. Something of the wreckage should have remained intact: the tail section, wings, engines, anything! There was no incredible fireball that could have produced the necessary temperatures causing the total absence of airplane. The Pentagon’s facade fell and it merely seemed as if there was more damage than there really was. If you see the early news reports, before the front fell, the real damage is only a SMALL HOLE. Apparently, a missile struck the Pentagon and formed the small hole; possibly a missile not unlike the one that brought down the famous Flight 800 some years ago. The Pentagon is probably the most secure building on Earth. Many high-tech cameras are positioned on the 5-sided exterior. Why haven’t they clearly shown us, on film, the plane coming in long before it crashed? Where is it? What they have shown us is BOOM, a quick blast...but there is no film of the approach of Flight 77. ’Whatever hit the Pentagon on 9/11 made a hole several meters wide in the front wall between the first and second floors. It emerged 3 blocks later, leaving behind a perfectly round hole of about 2 and a half yards in diameter.’ The original hole in the Pentagon was way too small. The hole was round and not the outline of a large, commercial airplane. The signs point to a cruise missile. The Power Hour documentary tells us that a 757 could not have caused the relatively little damage at the Pentagon. There are torn open offices with no burn damage. There should have been 8600 gallons of fuel that ignited in a tremendous fireball. The fires should have blazed for days and totally ruined that section of the Pentagon. That’s not what happened. A 757 has a wingspan of 125 feet. The hole in the Pentagon was not large enough to accommodate such a plane. ’In Plane Site’ shows us, frame by frame, that something is clearly attached to the bottom of the second plane in New York. Four cameras caught it and we see it slowed down from four different angles. The flash is to the right of the fuselage from what is probably an incendiary device. The THING on the undercarriage is right there, in plain view. Yet, we have been conditioned to not see it and believe the usual news reports. This was SHOW BUSINESS. 9/11 was trickery; an experiment in media manipulation. It was not terrorists with box cutters that created the flash just before the plane struck the building. Terrorists did not attach missile devices to the underside of the planes...unless you consider that we are the terrorists. Let us assume...this unconventional, underground idea is true. The 9/11 planes were not the planes that took off from Boston as the story goes. There was NO ONE on board the planes that we saw crash into the towers just like the magician is not really sawed in half. WHAT HAPPENED TO THE PEOPLE ON BOARD THE REAL FLIGHTS 11, 175, 77 AND 93? Where are the people? If a Boeing 767, (Flight 93) did crash in Shanksville, Pennsylvania...how do we explain the following report from WCPO TV, Channel 9 in Cincinnati? 9/11/01 11:43:57 AM. PLANE LANDS IN CLEVELAND; BOMB FEARED ABOARD. ’A Boeing 767 out of Boston made an emergency landing Tuesday at Cleveland Hopkins International Airport due to concerns that it may have a bomb aboard, said Mayor Michael R. White...United identified the plane as Flight 93.’ - Liz Forman. Which is the real Flight 93? The one that crashed in Shanksville or the one that landed in Cleveland? The question remains: Wouldn’t the real passengers have to be killed? Their living existence could blow apart the entire operation like Dorothy Kilgallen may have done to the JFK murder. (In the film ’Capricorn One,’ our astronauts had to be sacrificed to keep the secret of a faked and failed mission). Were the innocent lives on board the 9/11 planes taken in this federally backed and bloody, military operation? WorldNetDaily posted on 12/27/04 that RUMSFELD SAYS 9-11 PLANE ’SHOT DOWN’ IN PENNSYLVANIA. During surprise Christmas Eve trip, Defense Secretary contradicts official story. Do not believe the media. They are owned by the feds or federally owned corporations. Their secret job is to lie to you over the media. The media obeys the orders of the ruling fascists that own everything. This is the New Roman Empire. Why? (I have heard many ask the question WHY. My ’Man-Made Katrina’ article was met with similar skepticism). Why would the authorities create wars and suffering and unleash this upon its own citizens? It is in the world’s leader’s best interest to do so. ORDER from CHAOS is the motto of Secret Societies that rule the planet from the shadows. In New York’s case, 9/11 was created to send us to war and spread fear from a new enemy. In the Constitution, it states that only if the United States is physically attacked first, within our borders, can we declare WAR. That is why the Pearl Harbor incident, killing many Americans, was created by the secret leaders during the 1940s. Churchill was in on the bombings and FDR had prior knowledge of the Japanese attack. They warned no one. World leaders at the time were all in on it. They wanted a World War; again conning and using the public; just as the ones on top highly profited by Crashing the Stock Market in 1929. WW2 would become a very profitable venture for the Powers That Be. Nothing is different today. Look how many WAR movies were made before and after 9/11; too many. This is PROGRAMMING. The lousy, big-budget film ’Pearl Harbor’ played in theaters just prior to 9/11. This is not a coincidence; this is by design; this is mass orchestration. We are being DIRECTED by television and films and most people are unaware of the manipulation. (Even the PATRIOTS suspiciously won the Super Bowl right after 9/11). 9/11 was done to create a new menace. If the United States does not have an enemy, we will create one! 9/11 was manufactured to begin a War for Oil in the Middle-East. Bush, and other Oil people, Cheney, Rice, Tony Blair and the Vatican sanction and finance wars - weaponry - and destruction. The U.S. and England created this war as we invade and take over Iraq for OIL and big business profits. Our troops have killed many, many innocent women and children in this insane war. When the Gulf War was fought, our soldiers were killed by American weapons we sold to them. If Middle-East countries have Weapons of Mass Destruction, then these are WMD that we sold to them. ’We must always have war’ is another of their secret agendas. Do not fall for the Majic Trick. If enough people get together and learn the truth...maybe the world could and would unite in peace with real democracy and liberty. We are a bit wiser now and, hopefully, should wake up from the soma cloud the media has put us in. Big Brother truly exists. They are slowly killing us. Or, will they do it more quickly? Will an atomic exchange be the next great and super, utter catastrophe in our future? Hypothetically, if that were to happen, the Powers That Be (the guilty parties) would surely come out as if they were the good guys. Their escape routes would already be planned as contingencies to save only themselves. LET’S WAKE UP!